We spent a lot of our New York vacation eating. Since this is a dessert blog, I won’t go into too much detail on lunches and dinners, but some things are too good not to mention. But outside of the dessert tour, here are the other goodies we ate! Smorgasburg is a foodie’s dream. Keith and I are far too picky to eat from the majority of the vendors there, but there was certainly plenty to choose from! We did eat lunch first – macaroni and cheese and a grilled cheese sandwich from the Milk Truck. My drink choice was an Arnold Palmer made from honey cardamom iced tea and lemonade with chia seeds. Food from Mighty Quinn’s BBQ and Ramen Burger were also devoured, as well as a lobster roll from Red Hook Lobster Pound. I had never before thought about using ramen noodles as a substitute burger bun, but it worked! Then came the dessert. Keith had an ice cream sandwich made with vanilla ice cream with fudge between oatmeal chocolate chip sea salt cookies from The Good Batch. The sea salt is definitely something I’m putting in my oatmeal chocolate chip cookies! It was a great flavor addition. 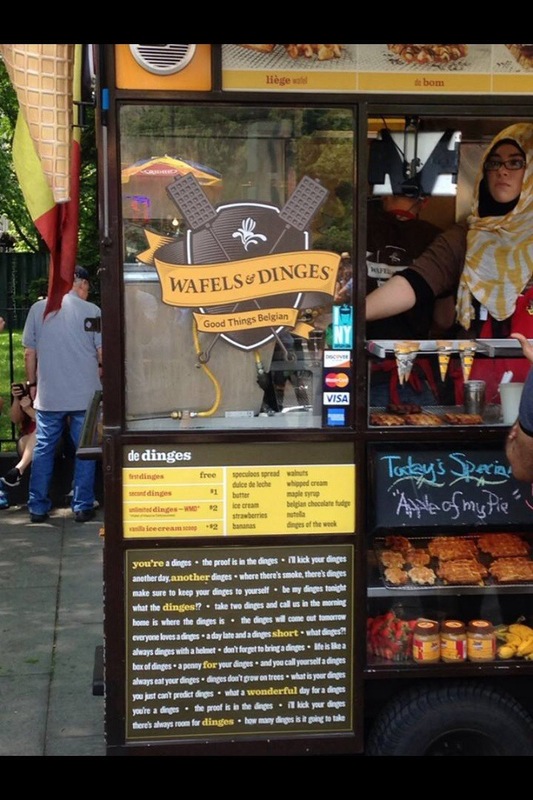 Translated to “waffles and toppings,” these trucks are all over the city. We came upon this one as we walked off the Brooklyn Bridge into Manhattan, and despite the fact that we had other dessert plans, it was determined that a stop was necessary. The four of us split a waffle generously spread with speculoos (cookie butter). As soon as Laura told me about this place (before we left North Carolina), I knew we had to go. Brooklyn Farmacy is, first off, an incredibly cool place. It’s a 1920s apothecary complete with old-school paraphernalia! I definitely recommend going to their website and reading the full story. Secondly, ICE CREAM SUNDAES. I read the menu online while still at home, and decided which sundae I wanted. Keith and I shared the sundae on the right, the Mr. Potato Head. It’s vanilla ice cream with homemade peanut butter, caramel, whipped cream and potato chips. All the flavors complemented each other without one standing out over another. The chips were nice and crispy and stayed that way, adding an awesome crunch to the other textures. Laura and Colin’s sundae is on the left, the Cookie Monster. It has mint chocolate chip ice cream with hot fudge, chocolate chip cookie crumbles, whipped cream and sprinkles. I couldn’t tell you how it tasted because we were too involved in our own sundaes to taste-test each other’s. But I can tell you that there was nothing left in either of those bowls when we left. In the next and last New York-themed blog post, I’ll talk about the one homemade dessert that made it on the vacation agenda!